GREAT SNOW! FEB & March dates available. Free Shuttle to ski area. Stowe Village Home 5 bedrooms, 6 baths, Walk to shops and mountain trolley. Nestled in the Village of Stowe, this nicely appointed home is listed on the National Registry of Historic Places. Built in 1860, the home has been tastefully renovated and still maintains the charm of wide-plank floors and 12 panel windows. An expansive deck on the back of the home provides a summer hideaway for relaxing or barbecuing on the gas grill. In winter, the living room provides a cozy place to enjoy the open fire. Winter guests enjoy the shuttle to the ski areas that stops nearby - no need to drive a car to the alpine or cross country slopes. Great skiing, ice skating rink within walking distance, and wonderful nearby restaurants. We are close to the Green Mountain Inn, the Stowe Community Church, and a short drive to the Stoweflake Resort and the Stowe Country Club. Bring your bikes and enjoy the award winning Stowe Recreation Path, a short walk from the home. We are close to the Stoweflake, and directly on the path to watch all the Hot Air balloons from the deck during the Stoweflake Balloon festival in July. There are five guest rooms, each with private bath, a formal dining room, a large living room area with warm winter fire, a laundry room and spacious/well equipped kitchen with granite counters and stainless steel appliances.. Three bedrooms are located on the upper level, and two bedrooms are located on the lower level. Bedrooms include 1 room with king-sized bed, 2 rooms with queen beds, 2 rooms with two extra-long twins that can also be set up as a king bed, and two roll away beds. A day bed also provides some additional sleeping space. Walk to shops, restaurants, winter shuttle at your doorstep. Off street parking. Golf, lakes and skiing nearby within 2-10 miles. All guest rooms have firm mattresses, are air-conditioned and decorated with Vermont style quilts and matching dust-ruffles. The living room has a classic wood-burning stove that opens to view the fire and closes for extra warmth, television w/ VCR & cable TV, sofa, love seat, a reading area and game table. The formal dining room seats up to 12 comfortably. Large deck and barbecue grill, workshop for tuning skis or bikes, mudroom entrance from the parking lot are all extra features. 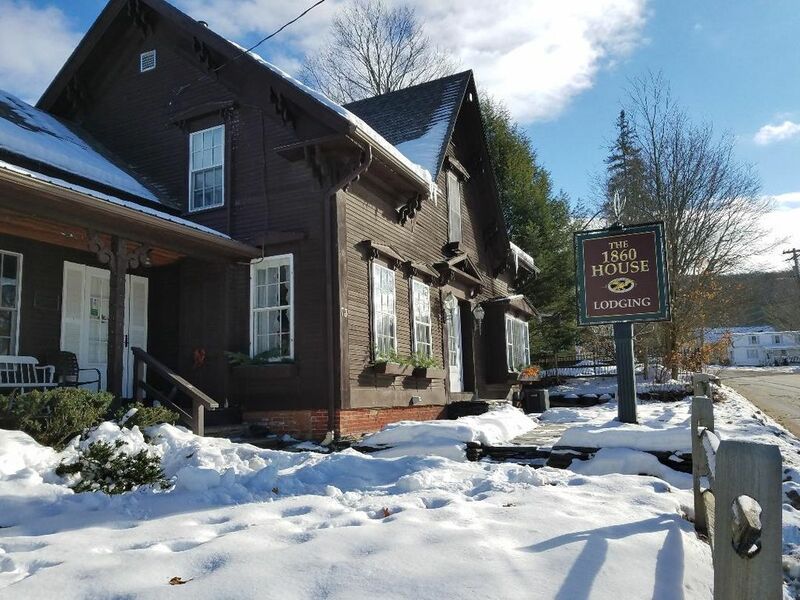 The property is located in the center of Stowe Village, near the Stowe Community Church (likely the most photographed location in Vermont) -a perfect spot for wedding parties or for the special guests of the bride or groom. Golf: During summer and fall, enjoy hiking or mountain biking on the numerous Green Mountain trails and the Long Trail, an extension of the Appalachian trail. The Stowe Country Club is an exceptional golf course just minutes from the Inn, and there are 3 other courses nearby. Late September and early October brings some of the best fall foliage viewing in all of New England. Visit the Vermont Teddy Bear Factory, the Trapp Family Lodge (still run by the Trapp Family from The Sound of Music), Cabot Cheese Shop, Ben & Jerry's Ice Cream Factory, Vermont Cider Mill and many other local attractions. Skiing activities: Mt. Mansfield at Stowe has a variety of terrain from beginning to expert skiing. Rated best ski resort in the East for multiple years, the ski terrain and charming village atmosphere make for a wonderful winter vacation. Alpine and cross country trails are minutes from the Inn. Local trolley/bus transportation provides easy access to the trails, ski entertainment is available. Combine your ski vacation with a spa treatment at one of the three exceptional spas in Stowe. I've owned the 1860 House for over 30 years. Retired from my Washington DC position as CEO of a national public health association. The property is used as vacation rentals and as an Inn part of the year. I love to travel and try to spend the winter months in a warm climate. I currently keep active in public health by teaching an online course for George Washington University. I also dabble in oil painting and watercolors. This is a home on the national register of historic places. I've enjoyed renovating it and preserving the integrity of the property. The Village location is ideal for me. I can enjoy all shops and restaurants and never have to get in the car. It is really convenient and a pleasure to walk to the recreation path, and hiking and biking trails. Stowe is a unique little village with an international flare. It was used by the British vacation company, Crystal Holidays for multiple years to bring Europeans to the ski area in the winter months. Great Village location in an exceptional ski resort village. Park the car and walk to shops, and restaurants, Well maintained historic property. Walk to the award winning recreation path used for walking, running, biking, cross-country skiing and leisurely strolls through the countryside. The Library and Art Center are directly across the street. Children will enjoy the nearby playground with lots of fun equipment. Free bus shuttle to the ski areas during winter months. All bedrooms have private attached bath, except room 2. The bath for room two is across the hall from the room. In the heart of the Village of Stowe with easy access to Mt. Mansfield and the Stowe Mountain Resort - ski capitol of the East. Also while you are in town, you will want to visit the Trapp Family Lodge from the Sound of Music....still operated by the family. The Green Mountains in the Stowe area offer wonderful hiking trails, ski terrain, both alpine and cross country and snowshoeing on the trails. Com and enjoy this lovely landscape. Located in Stowe Village one block off the main street. A quiet and convenient location. Walk to village shops and restaurants, local coffee vendors, and the award winning recreation path. All bedrooms have air conditioning with individual thermostats. Main living area is not air conditioned. A wood burning stove in the living room opens so you can look at the fire safely. Park in our private lot behind the house. Full internet access throughout the property. Bath towels, hand towels and wash cloths provided in each bathroom. Wood burning stove in living room with front doors that open to view fire. Kitchenaid Refrigerator. Double doors on top and freezer on the bottom. Gas four burner stove with oven. Can be used for regular baking or convection. Pfaltzgraff Java pattern. Placesettings for 16.
granite counters and stainless steel appliances. Large chopping block in the center. Accommodates lots of cooks. Flat screen TV in living room. Smart TV with both cable and wireless access. Stowe Mountain Resort, the Ski Capitol of the East, is 7 miles and 3 cross country centers are within 5 miles. The Stowe Shuttle (free) is available throughout the day and stops within one block from the house. No need for a car to head to the ski areas, or nearby recreation path in the summer. The house great for a large group and is in a great location too. I would definitely stay here again. Wonderful house in a great location! The owner was very responsive to even simple questions like, do you have a grill brush for the BBQ. Every kid had their own room which was a really treat and much preferred from the lodge experience. Thanks Rose for everything! The 1860 house is lovely and also could not be better located. We skied all day and had the lovely Stowe Village to explore in the evening. The owners have thought of everything you need and they are quickly responsive to any questions. The house is a real treasure -- spaces to eat together and hang out as a group and also easy to find a nook to read or look out the window. Each bedroom has its own bath which is great! It is a favorite for me and my family. Thank you Rose! Thanks so much for your kind review. So glad you enjoyed the house and the Stowe area. The property is beautiful. It's centrally located to all that Stowe has to offer. There's ample parking out back and you can walk throughout the village. 11 of us stayed here for a family wedding in town. The home comfortably slept 8 adults and 3 children. Rose was a pleasure to work with. I live locally and was able to meet with her the weekend before to view the property and determine which room was able to sleep 3 kids (ages 4-6). I would highly recommend this property and working with Rose. We had a great time. We’re 3 families and stayed very comfortably. Nice bathrooms , bedrooms and kitchen. Feel the living room tv was little small without any sound system, however this won’t impact my rating. Owner has very nicely welcomed us, very helpful and always reachable. Thank you. Please come visit again. Amazing kitchen, good location. We had a good time. Experience the charm of a 200 year old town at this center village location. Enjoy walking to village shops and restaurants, or sitting in front of the warm fire with a good book. During the winter months, take the trolley that starts nearby to the Stowe Mountain Resort for Vermont's best skiing and snowboarding at Mt Mansfield or Spruce Peak. Stowe Mountain Resort is rated Best in the East by Skiing Magazine in 2003! There are also four cross country ski centers within 7 miles of the Inn. The Stowe area also has extensive trails for snow shoeing. For a change of pace visit one of Stowe's three exceptional spas, visit the world renown Trapp Family Lodge, home of the Von Trapps from the Sound of Music, tour the art exhibit at the Library/Art Center across from the property, and enjoy the 50+ exceptional restaurants in the area. Golf: Exception golfing nearby. Stowe Country Club is an 18 hole course and the Ryder Brook Farm is a 9 hole course. Withing a 30 minutes drive there are 3 additional courses. Ski: Mount Mansfiled at Stowe Resort is consistently ranked as one of the best ski resourts on the East Coast. There is also excellent cross country skiing at one of the four major resorts including the Trapp Family Lodge, Edson Hill Manor, Mt. Mansfiled Cross County. Holiday reservations can only be cancelled within seven days of the reservation and first deposit. Other cancellations are non refundable within the last 30 days prior to the arrival date.